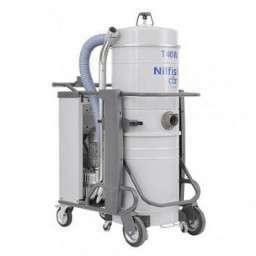 The Nilfisk CFM T40W is a three phase industrial vacuum generating powerful airflow. This means that it is ideal to collect high quantities of chips, dust and other production waste very fast. Model T40W can also collect liquids. Model T40W is equipped with L or M class filter for the collection of very fine dust, it can also be fitted with an optional HEPA absolute filter for the collection of hazardous dust. 4 kW side channel blower on a strong steel chassis.